Lasers in SkerriesThe Laser fleet in Skerries Sailing Club has seen continued growth and success in recent years. The fleet consists of three different types of Laser dinghies – Laser 1, Laser 2, and Laser Stratos – providing a very exciting racing environment! The Laser 1 is a single sail one-person dinghy. It has three simple, interchangeable rigs, or sails, to cater for all sizes and abilities of sailors. This is a great single design boat that can be viewed as either a cheap starter boat or suitable for competing at the highest level. option for both helm and crew. A high volume of Laser 2 dinghies on the market allow for a cheap starter options or a high-performance competitive racing prospects. 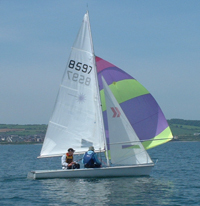 The Laser Stratos (below right) is a relatively new dinghy to Ireland. It is a two-person dinghy with trapeze, jib, main and genniker benefiting from modern mylar sails and offering high speed blasting. It is a little longer and broader than the Laser 2, thus giving older – and possibly bigger! 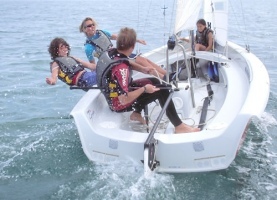 – sailors a chance to sail and race competitively in a high-performance dinghy. Enjoyment of sailing together against the varied classes enables racing with handicaps finalising positions but the experience of meeting your match for the differing wind conditions keeps us all entertained. The club is very active in promoting these fleets having successfully held the Laser Leinsters catering for over 160 boats in multiple fleets. Lasers are possibly the most common dinghies sailed today resulting in an abundance of boats available. If you know of anyone with a Laser lying idle in a garden do not hesitate to advise them if could be put to better use. The Laser fleet welcomes both beginners, improvers and experienced sailors who are looking for competitive, one-design racing. Training, lectures and coaching are organised throughout the year, and members of the fleet would be only too happy to bring you out on the water should you wish to try a boat. Please contact the class captain, John Fizgerald, for any further information you would like on the Laser fleet, or if you would like to try out one of our Lasers on the water.